-What medium do you use, and why did you choose this medium? My art is taking you to a magic explosion of dreams through the geometric forms, acid reality and dreamland emotions. My collages are all created by hand with pictures and paper colours. Everything around us became so digital, that priority I prefer to give to the manual part of the illustration, work with paper, scissors and glue. This keeps more intimate and personal relationship and connection with my art. At the same time digital work already became a part of our lives in everyday basis, including mine as well, but as mentioned above, the priority will be always given to the manual steps of the creation. -What message do you wish to send to the audience? When someone sees your art, what do you hope they will grasp or enjoy about the paintings? Fashion and art are needed to continue creating new stories, collage allows you to create endless compositions full of freshness and energy. 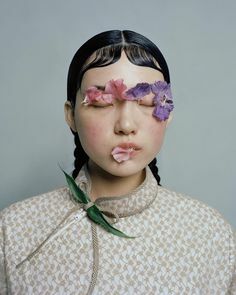 editorial fashion world has to offer more creative content to convey a strong message to the public.Collage is an amazingly perfect space allowing us to create and lift up the connection of fashion and art. I feel blessed to be able to talk into the world through the connection of the strongest inspiration spheres ever. I truly believe that connection and communication of art and fashion advertising through collage provides everyone with deep rich inspiration in my case talking through the freshness and energy of the stories created by collage art. -How do you get inspired? What piques your interest? My work is influenced by everything around me , emotions are very important to create my artwork. -What is the most challenging part about your medium? It is always good to keep a balance between staff and customer philosophy, be true to yourself and follow the path of creation without limiting creativity. My work uses advertising as an ingredient in creating and ultimately is a game of art and advertising . In order to keep the golden balance of art and commercial world inside of my art space, I truly follow and respect the mantra of my life to be true to myself, follow the path of creation my inner world have chosen without limiting myself and without closing the real Lauro Samblás to any frames or dogmas sent from outside the world. -What is your creative process like? The most important in the illustrations is the selection of images, colors and forms. Before you start gluing the most important thing it is to have all graphic material. -What are your life goals in 5 years?